While it’s not surprising that breast implants may affect mammogram results, tattoo ink can trick radiologists into believing that a woman’s lymphatic system is wrought with cancer. Marla Ahlgrimm notes that this surprising form of mimicry is caused when tattoo ink spreads throughout the body. Even in minute quantities it can be picked up by sensitive imaging equipment. Tattoos and breast implants are extreme forms of body modification that not everyone will have to worry about. However, most women, in the spirit of good hygiene, tend to wear deodorant and/or antiperspirant on a daily basis. For reasons that are little understood, some deodorants contain chemicals that may read as a white spots on a mammogram, which will ultimately lead to retesting. 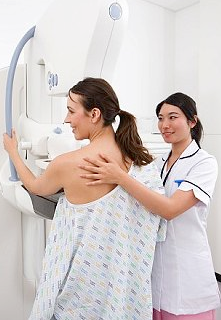 Marla Ahlgrimm suggests scheduling mammograms for first thing in the morning and forgoing deodorant until afterwards. Despite an unfortunately high number of false positive readings, women beyond menopause should discuss having a mammogram with their doctor.